Discover the benefits of ornamental fencing. 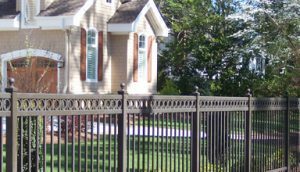 Whether you are looking for a fence to surround your residential or commercial property, you should consider purchasing an ornamental fence. Not only is fencing a giant part of the overall aesthetic of your home or property, but it also serves a practical purpose. Fencing not only keeps people in or out of your yard, but it also clearly defines property boundaries, giving your space a clean, neat finish. Ornamental fencing is a great choice for those who not only want form out of their fence, but function as well. Ornamental fencing of course looks nice, but it is not just for decoration. An ornamental fence is a barrier between your property and the rest of the world. It makes a great deterrent for trespassers or vandals that may otherwise some into your property and damage it. Although from the name, you may not think it, many ornamental fences are extremely durable. Far from fragile, ornamental fences can be made from high quality aluminum or steel to make the resistant to a host of environmental conditions that would damage another, different fence. Many ornamental fences come with a lifetime warranty, in fact. Another reason ornamental fences are a great choice is that they do not rust. Because they are made or aluminum or steel, ornamental fences are super resistant to rust and water damage. Resistance to rust is very important, especially if your fence will be near a body of water or be in a moist or humid climate. When it comes to ornamental fencing, there is no maintenance required! You have enough to worry about, and maintaining your fence should not be added to your extensive list of chores. When choosing a fence, we doubt you just want it to serve its utilitarian purpose anyway. Picking a new fence is a great way to liven up your property or express your own personal style in a subtle way. You will be able to choose from different style, fitting, and door options when you decide to invest in an ornamental fence. In addition to hundreds of styles and finishes to pick from, ornamental fences also work with a variety of architectural and landscaping designs. Whether your yard is sloped or flat, an ornamental fence will work. Not only will your ornamental fence match with the aesthetic appeal of your particular area, it will even enhance it. Whether you are ready to purchase your new ornamental fence or you still have more questions, we here at Hercules Fence and Newport News have the expertise to guide you. We have a large amount of experience in wood, aluminum, chain link, steel, and vinyl fences with offices in Manassas, Richmond, Newport News, Norfolk, Maryland, and North Carolina. To get a free quote today, call us at 757-316-2600 or visit us online! This entry was posted on Monday, November 12th, 2018 at 4:16 pm. Both comments and pings are currently closed.